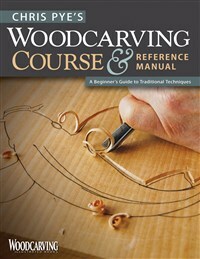 A comprehensive guide for those who want to learn carving, this manual provides a handful of lessons, including how to choose the best woods, safe tool handling tips, making cuts, and executing a variety of techniques. Chris Pye has been a professional woodcarver for than 25 years and is a member of the Master Carvers Association. His work is done mainly to commission, with clients including HRH the Prince of Wales. It ranges from architectural moldings to figure carving, furniture to lettering, bedheads and fireplaces. He has also written extensively about woodcarving for several magazines.